There is a universal appeal to things that come around once a year. Pumpkins on the porch, Christmas Carols, asparagus (yes for some asparagus makes April exciting) . . . these would not be nearly as much fun if they were “everyday” occurrences. 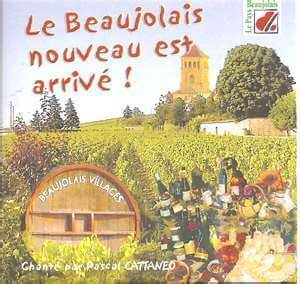 I think this is why of all the Beaujolais wines, Beaujolais Nouveau (bō zhō lay new vō), gets the most press. Beaujolais is a wine growing region in the southern part of Burgundy. The grape of Beaujolais is the Gamay. 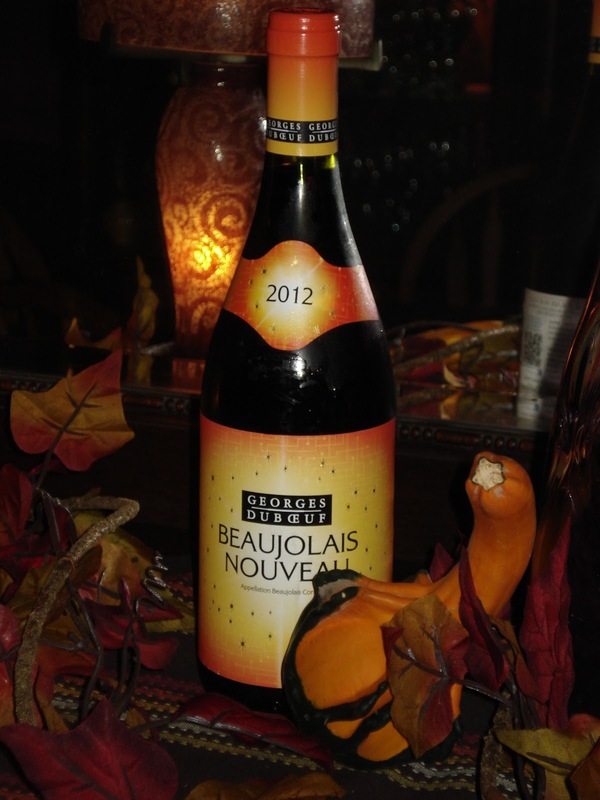 And once a year, the third Thursday in November, Beaujolais Nouveau is released and the banners in Paris announce – Le Beaujolais Nouveau est arrivé! The tradition has its origins in the 19th century. People in Beaujolais and Lyon happily drank this young wine as a connection to the harvest and the hills of Beaujolais. Distribution and popularity spread to Paris, Britian, the US, and Australia and good publicity lead to high celebration. In France there is a race to get the first bottle to Paris. As part of the festivities, transportation modes over the years have included airplanes, motorcycles, rickshaws, balloon, and even elephant. I’m thinking the jet got there first. Beaujolais Nouveau, as well as much of the Beaujolais production, is made through a special process called carbonic maceration. This a whole berry fermentation and results in a red wine that has hardly no tannins (similar to the texture of a white wine) and flavors including – bubblegum, cotton candy, cherry, banana, raspberry, cinnamon. While aromatic and dry, they are not complex and fall into the “easy drinking or easy gulping” category. They should be served slightly chilled. Our opinion is, who cares as long as you like it. While there are many brands, Georges Duboeuf is widely distributed so we tasted his 2012 Beaujolais Nouveau. At this point I would like to introduce you to the Wine Witch who is itching to share her critique. This bottle is going down the drain. I didn’t even finish the glass. Don’t even want to use it for cooking. It smelled as expected, bubblegum, banana, strawberry, cherry. It pretty much tasted like it smelled. The problem occurred on the finish. It left a metallic taste like licking the inside of an aluminum can. I have had better jug wine. I want my $12 back!!! 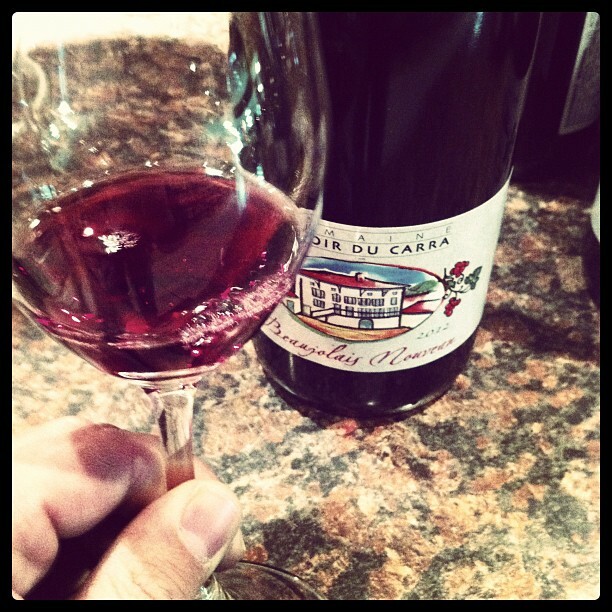 We have been told that other 2012 brands (like Manoir du Carra) have all of the fruitiness you would expect without the tin can finish. But you will have to find out for yourselves. The Wine Witch and I will wait until next November for more Nouveau. And while some Beaujolais wines are nice for Thanksgiving Dinner, click here for some super pairings. The region makes more than just this young fruity wine. Look for Beaujolais Villages on the label for a typically nice poor man’s substitute for any recipe that calls for a red Burgundy. 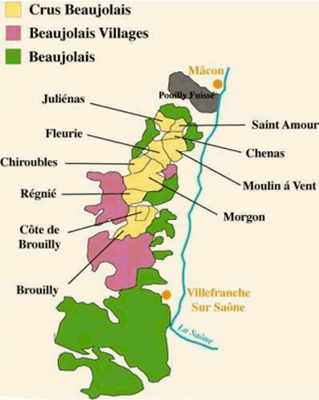 To experience the best Beaujolais has to offer, look for a label without the word “Beaujolais” and that states one of the villages found on this map.